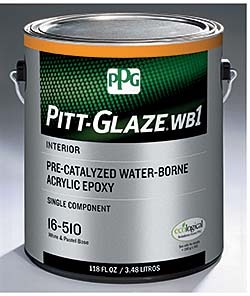 Pitt-Glaze WB1 is formulated to provide maximum protection and service life in high-traffic areas. The acrylic epoxy is formulated with low levels of volatile organic compounds and is low-odor and water-born. The paint helps minimize facility disruptions during and after application. It requires no mixing or measuring and has an unlimited pot life.